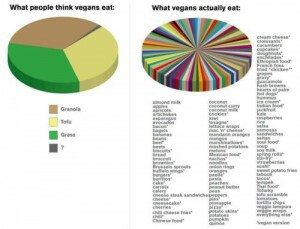 This terrific graphic, er, graphically shows that vegans just don’t eat brown rice, grass, muesli and leather sandals. This whizzy wheeze is produced by the Web site, I Love Charts. Why not send this graphic to everyone who can’t (or won’t) understand what vegans eat?